Bruce Meyers showed off his new 2006 and 2011 modular mics.Bruce Meyers gave me an in-depth demo of the new 2006 and 2011 modular reference mics from DPA. As you know, I'm a huge fan of the 4098 HB hanging choir mics. Bruce told me the goal with the 2006 and 2011 was to bring most of the sonic quality that the 4006 and 4011 Standard Reference Mics are known for down to a price point that us mere mortals can afford. 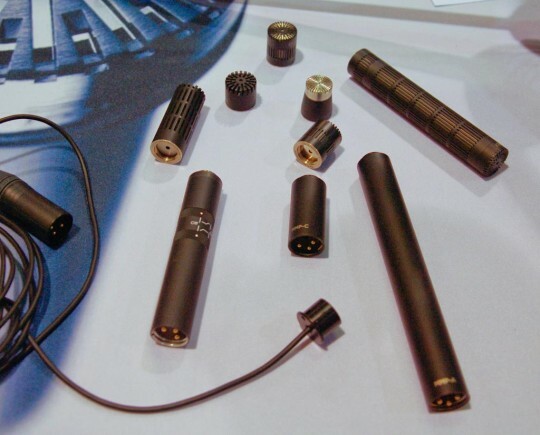 The cool thing about this product line is that you can buy the mic bodies (which house the pre-amp and other electronics) at a reasonable price and start with the 2006 or 2011 capsules and have 85-90% of the high-end performance. When budgets allow, you simply purchase the 4000 series capsules and you have the top of the line. Bruce tells me that for under $800 users will be able to get into a 2006 or 2011 with the short back, which is not bad. And see that cord with the small plug on it? That's a super-low profile XlR cable; perfect for hanging installations. I heard the 2011 compared to the 4011 and have to say the differences are there, but very subtle. For super-high end recording, the 4011 is hard to beat. But for less critical, lower budget or live work, the 2011 is going to be a top choice for a lot of people.